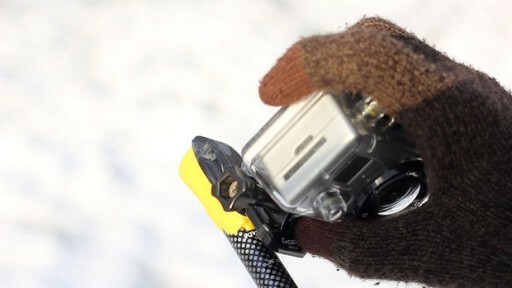 GoPro cameras have became almost synonymous with low-risk-stick-it-anywhere cameras. 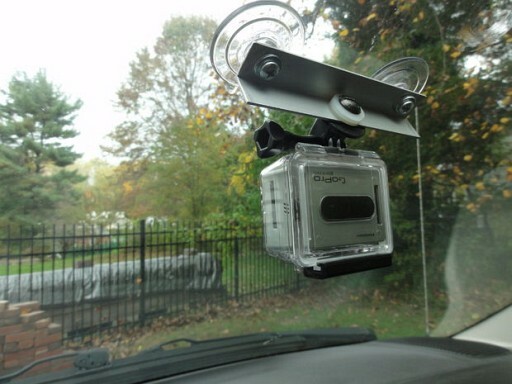 And they can really be stuck almost anywhere given the proper mounting solution. The black edition ability to record 1080p videos @60fps (or 720p @120fps) without worrying too much about killing the camera makes is a great tool for sport-extremists and movie makers alike. But, as we said before, given the proper mounting solution is key to paling the camera in weird location. 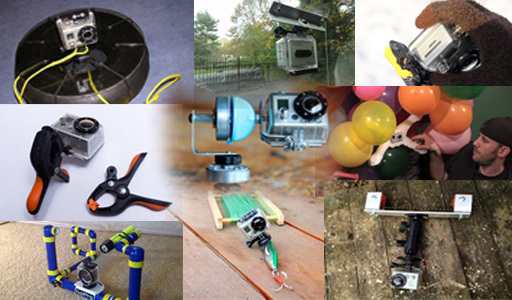 Here are 11 DIY solutions to sticking a GoPro practically anywhere. Click any of the titles after the jump to read the full tutorial. 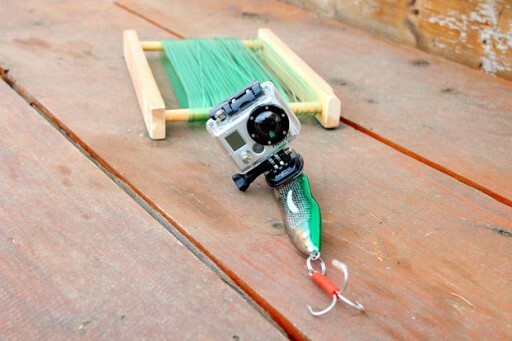 I am not really sure why anybody would want to attach a GoPro to a fishing bait, but if you end up really wanting to this tutorial will explain how it’s done. Including a 4 minute video featuring a mighty struggle between a fish and a bait. 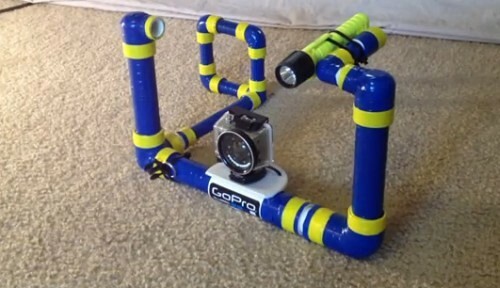 Staying in the underwater realm, this PVC rig is a great tool if you are diving with a GoPro. it facilitates both lighting snaps to attached lighting and a back bracket that locks on your hand to reduce movement. Looks wise, the rig is modular and can attach different lights or gadgets to each end. We love Sugru here at DIYP, as it is probably the easiest, funnest way of quickly molding plastic parts. We did occasional wonder how strong this stuff is. Pretty strong, it turns out as shown in this pro pole adaptation done with Sugru. The sample footage is downhill skiing and is pretty cool. While using a go pro for time lapse is not as common as we’d like, but it has an internal intervalometer allowing a time lapse configuration. And while there are many egg-timer-based timelapse devices around, this one if the first I’ve seen to have to devices: both on the horizontal plane and on the vertical plane. This is one of the fastest hacks on the list and it will only take a short trip to the hardware store and about 3 minutes of your time. It’s simple and smart. and produces great travel time lapses. As its name states, it’s made with two suction cups and an aluminum bar. Cable cams are used to cover a long line while moving fast. And this build for a GoPro is no different. 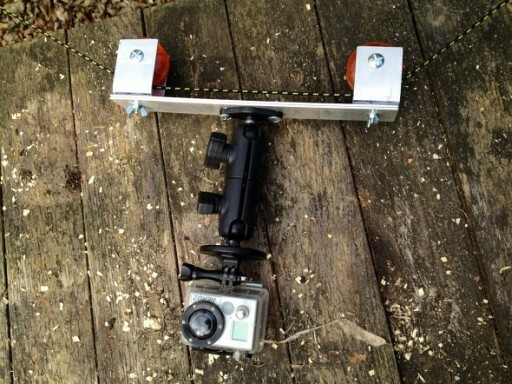 Using a metal bracket and two skateboard wheels this cable cam is really easy to make. Watch the footage taken at a trail ride to see the full effect of a long run action shot. Have you seen Up? 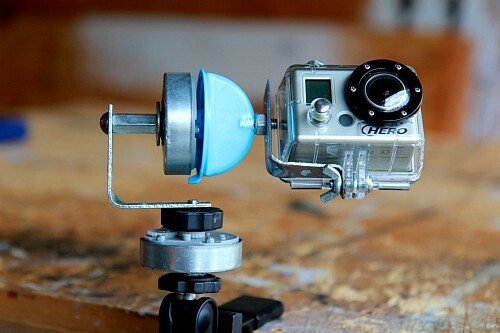 This is the GoPro version of Up. Only instead of floating a house, these guys are floating a GoPro. 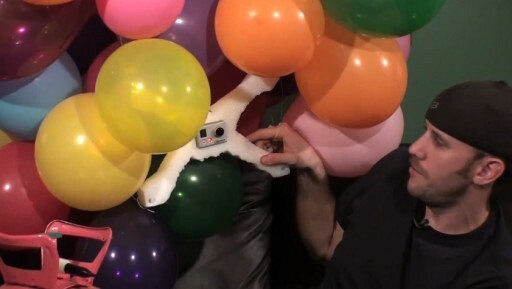 It is mounted in a Styrofoam X and (12 points for bravery) it is friction fit into the Styrofoam while being pulled up by the balloons. Tethering is achieved with a fishing poll. Nice! I wish I lived in a place that sells compressed helium. If they had used a soloshot attached to the cable cam and then the gopro attached to the soloshot the video would have been perfect! He/she can count. You better check again.